An exclusive discount for Amazon Prime members. It's always frustrating when your favorite mouse gives up the ghost. Sometimes it's because the scroll wheel stops working and in other cases the button switches wear out. 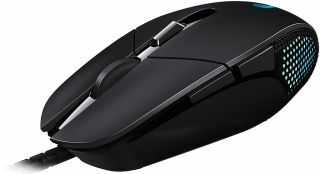 Whatever the reason, if your rodent is wrecked (or if it's on its last gasp), here's a heads up that Logitech's G302 Daedalus Prime MOBA gaming mouse is on sale for $25 at Amazon. There's a caveat—you have to be an Amazon Prime member to score the peripheral at that price. Being a Prime member comes with several perks, the most popular of which is free 2-day shipping on a ton of stuff, though you're looking at a $99 annual fee. Alternatively, you can opt for an $11 per month membership if you don't want to commit to an entire year, or sign up for a free 30-day trial and cancel before it renews. If you're a student, Prime runs $49 per year, with a 6-month free trial to boot. Back to the mouse. The G02 Daedalus Prime features six programmable buttons and has on-the-fly DPI shifting (240-4,000 dpi). It also boasts a metal spring tensioning system for the left and right mouse buttons. This is a relatively light and compact rodent measuring 4.35 x 2.56 x 1.46 inches (HxWxD) and weighing 3.07 ounces. Logitech claims it collaborated with professional MOBA players on the design. You can grab the Logitech G302 on sale here. It's backed by a 2-year warranty.